Shri Shankara said – Liquor, which is under a curse, is the form of the Absolute. Freeing it from the curse it becomes the Absolute itself, the supreme ambrosia. O Devi, it becomes like this by offering to Mahadevi. Among the many meanings of the word tantra (root tan, “extend,” “continue,” “multiply”), one concerns us particularly – that of “succession,” “unfolding,” “continuous process.” Tantra would be “what extends knowledge” (tanyate, vistarayate, jnanam anena iti tantram). We must reckon with possible Gnostic influences, which could have reached India by way of Iran over the Northwest frontier. For more than one curious parallel can be noted between tantrism and the great Western mysterio-sophic current that, at the beginning of the Christian era, arose from the confluence of Gnosticism, Hermeticism, Greco-Egyptian alchemy, and the traditions of the Mysteries. It is noteworth that tantrism developed in the two border regions of India — in the Northwest, along the Afghan frontier, in western Bengal, and especially in Assam. On the other hand, according to Tibetan tradition, Nagarjuna was a native of Andhra in southern India — that is, in the heart of the Dravidian region. … for the first time in the spiritual history of Aryan India, the Great Goddess acquires a predominant position… In Hinduism, the Sakti, the “cosmic force,” is raised to the rank of Divine Mother who sustains not only the universe and all its beings but also the many and various manifestations of the gods. Here we recognize the “religion of the Mother” that in ancient times reigned over an immense Aegeo-Afrasiatic territory and which was always the chief form of devotion among the autochthonous peoples of India. But we also recognize a sort of religious rediscovery of the mystery of woman… every woman becomes the incarnation of the Sakti. Mystical emotion in the prsence of the mystery of generation and fecundity — such it is in part. But it is also recognition of all the is remote, “transcendent,” invulnerable in woman; and thus woman comes to symbolize the irreducibility of the sacred and the divine, the inapprehensible essense of the ultimate reality. Woman incarnates both the mystery of creation and the mystery of Being, of everything that Is, that incomprehensibly becomes and dies and is reborn. A well known myth thus accounts for the birth of the Great Goddess. A monstrous demon, Mahisa, threatened the unverse and even the existence of the gods. Brahma and the whole pantheon appealed to Vishnu and Siva for help. Swollen with rage, all the gods put forth their energies in the form of fire darting from their mouths. The flames joined into a fiery cloud, which finally took the form of a goddess with eighteen arms. And it was this goddess, Sakti, who succeeded in crushing the monster Mahisa and thus saved the world. We must never lose sight of this primacy of the Sakti – in the last analysis, of the Divine Woman and Mother – in tantrism and in all the movements deriving from it. It is through this channel that the great underground current of autochthonous and popular spirituality made its way into Hinduism. Philosophically, the rediscovery of the Goddess is bound up with the carnal condition of Spirit in the kali-yuga. Thus the tantric writers present the doctrine as a new revelation of timeless truth, addressed to the man of this “dark age” in which the spirit is deeply veiled under the flesh. Tantra is antiascetic and antispeculative. “Donkeys and other animals wander about naked, too. Does that make them yogins?” – Kularnavatantra. Viewed from outside… tantrism would seem to be an “easy road,” leading to freedom pleasantly and almost without impediments. …all contraries are illusory, extreme evil coincides with extreme good. Buddhahood can – within the limits of this sea of appearances – coincide with supreme immorality; and all for the very good reason that only the universal void is, everything else being without ontological reality. But the “easiness” of the tantric path is more apparent than real… The fact is that the tantric road presupposes a long and difficult sadhana, which at times suggests the difficulties of the alchemical opus. … the void (sunya) is not simply a “nonbeing”; it is more like the Brahman of the Vedanta, it is of an adamantine essense, for whch reason it is called vajra (=diamond). “Sunyata, which is firm, substantial, indivisuble and impenetrable, proof against fire and imperishable, is called vajra.” (Advayavajra-samgraha). For tantric metaphysics, both Hindu and Buddhist, the absolute reality… contains in itself all dualities and polarities, but reunited, reintegrated, in a state of absolute Unity (advaya). Goddess of Beauty and Play and Love and Joy! Let us invoke the sweet smelling one! Her arms granting boons and dispelling all fear. Her heart aflame with passion and fire! Aom! I salute the beautiful one of three worlds! Obeiassance to the Lotus eyed one of sweet nectars, Jai Pankajakshi! Aom! With incense of sandal I salute Thee! Jai Devi! Aom! With lights I salute Thee! Jai Istadevi! Aom! With water I salute Thee! Jai Sarvagata! Be favourable to me, oh blossom honey of light! in your sweet smelling presence, Jai Shrimati! to your devotions, oh Vibhutidevi! With the bijamantra HRIM I invoke Thee! 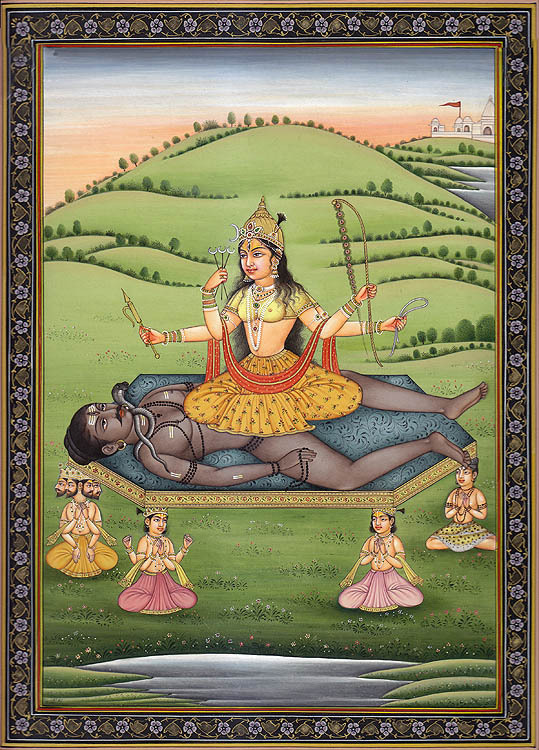 Jai Tripurasundari! Jai Lalita! Jai Devi! Oh, Mandayanti, grant me Thy grace! Give me of Thy milk to drink! Oh, Jayesvari, inform me with Thy blood kissess! Let Thy brilliant light shine through me, fullfilling me of Thy divine embrace! Jai Sadhya! Jai Sadhwi! Jai Sara! Jai Savitri! Aom! (Pankaja “mud born, lotus” + akshi “eye”) The lotus eyed. (sarva “all” + gata “having gone”) Having pervaded all, having reached everywhere. (shri “beauty, light, wealth” + mati “having”) Having beauty and fortune, the beautiful. Glory, might, wealth. Consecrated ash used by devotees of Shiva. Also the 6th of Lalitas 108 names. (jaya “victorious” + iswara “sovereign goddess”). The victorious goddess. Sadhya, “the attainable,” a name of Lalita. Sadhwi, “the virtuous.” Sara, “the Essence.” Savitri, the consort of the Sun. Built up from the traditional Lesser Pentagram Ritual of the Golden Dawn (see Liber O vel Manus et Sagittae, section IV), while similar in some aspects, the Star Ruby also has many significant differences in its structure; for example, using Greek instead of Hebrew intonations; similarly, while its predecessor is suitable for both invoking and banishing elemental forces, the Star Ruby is exclusively a banishing ritual – and a truly thorough, focused, and exceedingly powerful one. The rituals do build upon one another, and it has been found beneficial in my experience to first master the older form before working with this new and improved ritual. The ritual opens with the establishment of the divine form of Hoor-paar-kraat in the operator, as he assumes the Sign of Silence. The successfully establishment of this form and condition of consciousness is central to the remainder of the ritual, for it establishes within the magician the center of authority within as the “still, silent self” of the Divine Child Harpocrates, a symbol of the Holy Guardian Angel that is effectively known and experienced as the True Will. From this center of Silence, the calm depths of true power, lying timeless in eternity, we now move into action. The lightning flash of Will is invoked to banish by fiat with a “great sweep” of the right hand “down and out, expelling forcibly thy breath” the words Από πάυτως κακοδαιμουος (“away every evil spirit.”). With the same forefinger touch thy forehead and say ΣΟΙ, thy member, and say Ω ΦΑΛΛΕ, thy right shoulder, and say ΙΣΧΥΡΟΣ, thy left shoulder, and say ΕΥΧΑΡΙΣΤΟΣ then clasp thine hands, locking the fingers, and cry ΙΑΩ. In the sparse notes to the ritual given in Liber 333, Crowley informs us in a footnote to the phrase Ω ΦΑΛΛΕ that the“secret sense of the words is to be sought in the numeration thereof.” The isopsephy of this injunction to the solar-phallic creative God has a value of 1366, which is identical to that of κτεις (535) + φαλλος (831), or yoni + lingam. Another phrase with this same value is η φωνη, “the voice.” Thus visualizing oneself standing as a radiating erect column of light, crying out in Greek words which may be translated“Thy, O Phallus, Mighty, Beneficient, IAO!” the creative and irresistible universal currents of Love, Life and Liberty are invoked. The ritual then proceeds to the establishment of the quarters, with a flaming pentagram visualized at the forehead and cast forth into each cardinal quarter with the forceful Sign of the Enterer. The older form of the ritual from Liber 333 uses the formula of יהוה in descent around the perimeter of the circle as the magician moves widdershins, so that to the East is associated Fire and the Lion Kerub; to the North is Water and the Eagle Kerub; in the West, the Kerub of Man and Air; and finally in the South the element of Earth and the Bull Kerub. The characteristic vocalization of each Kerub is used to project the name out into the quarter: the roar of the Lion, the scream of the Eagle, the voice of Man, and the bellowing of the Bull. The circle being completed, the magician returns to the center of the circle and raises “thy voice in the Paian” invoking Pan under the starry dome of Night, and giving the Signs of N.O.X. in such a way as to show the progression up the Tree of Life and across the Abyss. Then the magician, standing in the radiant form of the solar-phallic cross, calls forth the guardians of the quarters and the effulgent ensigns of the Pentagram and Hexagram. The guardians called forth in this ritual are not those of the Hebraic Archangels as in the Lesser Ritual of the Pentagram; rather, the Star Ruby appears to be working with beings that first find their description in the Neoplatonic accounts of Proclus. The rite then concludes with the Qabalistic Cross again, followed by the banishing by fiat. These names and vocalizations would be changed in the later version of the ritual, using Therion, Nuit, Babalon and Hadit instead. The later form is more in alignment with the structure of Liber V vel Reguli. Originally restricted to the use of Adepts of the Ordo Roseae Rubeae et Aureae Crucis (“Order of the Ruby Rose and Golden Cross), the secret Second Order of the Hermetic Order of the Golden Dawn, the ritual of the Hexagram saw the light of day with Crowley’s exposure of the Golden Dawn rituals throughout the serialized Equinox. With many subsequent exposures of the Golden Dawn’s curriculum, the ritual of the Hexagram has a much wider audience and is now common knowledge, if not use, among many magicians. One can buy a variety of books, ranging dramatically in quality, to find amongst the arcane exposed gnosis the Lesser and Greater Rituals of the Hexagram. Yet, despite this, the ritual remains somewhat obscure to most. While the Pentagram rites are now ubiquitous amongst magicians both seasoned and new, the formula of the 6-fold star remains more mysterious, even allusive. Unlike the Pentagram rituals, which are elemental and far wider in application, the Hexagram rite was originally designed for the Adept of the Golden Dawn, and contains symbolism based upon their reception into the Second Order. The Signs of L.V.X. which open and close the rite are the symbolic gestures by which the Adept attuned to the forces of the Tiphareth as the Sun of the Soul, a representation of the GOD-MAN or homo superior, being the keys by which the symbolic Vault of Christean Rosenkreutz was opened. The Analysis of the Key Word I.N.R.I. were a further reflection on the cycle of life as represented by the Sun, as well as that interior luminary which serves the the Lamp of the Magus. The six points of the figure are attributed to the 6 classical planets in their order as given on the Tree of Life, with the radiance of Our Father Sol in the center. Each planet in turn may be associated with the inner centers of spiritual force, the chakras of the Hindus, as well as with Zodiacal influences. And so we see that the symbol is at once a reflection of the living Truth of the Emerald Tablet; once again, “as above, so below.” The planets in their movements in the heavens are reflected in the interior centers of force in our psychospiritual makeup. Through geometric Kabbalah the six-pointed figure is associated with the sixth sephira on the Tree of Life, Tiphareth, the “interior sun” of the magician. As a symbol of union, the macrocosmic star represents the union of the magician with the Holy Guardian Angel. The interplay of extremes such as fire and water, light and darkness, Will and Love, symbolized by the union of the two triangles, all reflect on the nature of that attainment. As such, a full understanding of the Star of the Macrocosm may be found within the heart of the magician herself, as a reflection of the Truth of which we are all an expression. Where the 5 points of the pentagram show the aspiration towards the divine with an equilibrium of elements and a seeming craving for the radiant L.V.X., the hexagram expresses the brilliant fire of the Gnostic Sun surrounded by six centers of force in perfect equipoise. One may enter the true Vault of the Adepts by apprehension and application of this symbol in the life of the magician.